Derby is the awesome feature being introduced by Super Cell in Hay Day. This made Hay Day players more professional in the game rather playing friendly. 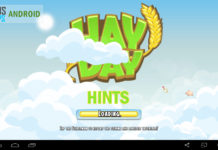 So, here are few Hay Day Derby Tips and Hay Day Derby Cheats and Strategy which will help you to win and play friendly as well. Hay Day Derby starts every Tuesday 11:00 pm GMT time and ends at the same time as of starting time at 11:00 pm GMT on Monday and started from Level 18. So, there is a 24 hours gap before new derby starts and in this mean while change of neighbourhood can be possible though neighbourhood can be changed too while the derby but this wont allow you to collect derby rewards. When Hay Day Derby was introduced it was rather simple, only a person had to do task and win for their neighbourhood. Neighbourhoods that play during the derby comprises of usually 15 neighbourhood. However there are two similarities between the participating neighbourhoods. Firstly, all have equal number of members and all have the same average ranking as of previous derby. Recent update initiated the concept of Hay Day Derby Leagues . 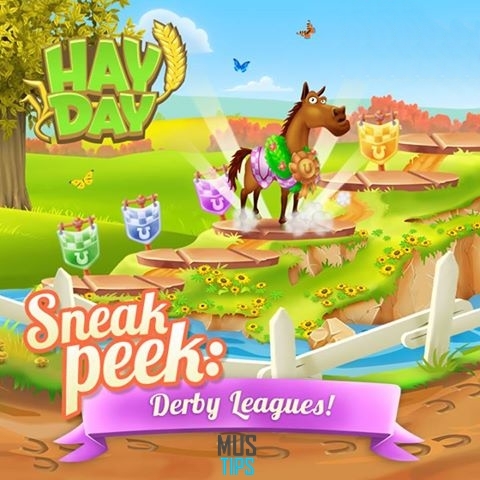 Hay Day Derby Leagues comprises of five leagues ; Rookie league, Novice League, Professional League, Expert League and Champion League and most important opt in and out function which helps you to omit the next derby in case you did not want to participate in next derby or your are busy. . Rookie league is composed of 5 tasks with one additional task that cost you 10 diamonds. 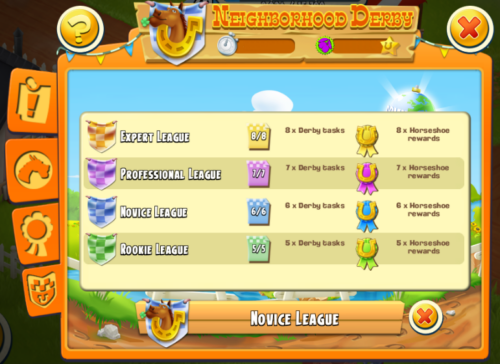 While Novice league is comprised of 6 tasks, Professional League of 7 Tasks, Expert League of 8 Tasks, Champions League of 9 Tasks with some exciting Hay Day Derby awards and all are followed with one additional task. Neighborhoods finishing the derby in top three move up to a more challenging new derby league. 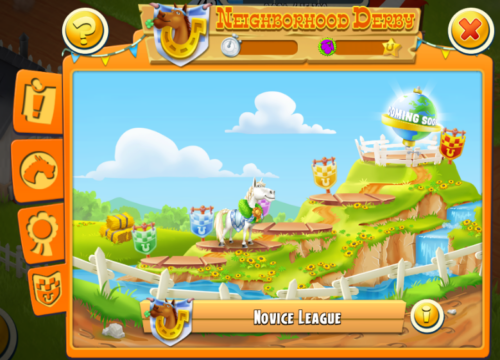 Neighborhoods ending the derby in last three or who did not reach the first horseshoe checkpoint move down to the previous league . Remaining neighborhoods play same league in the next derby. 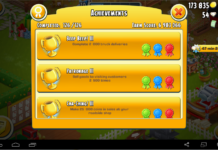 If you want to win Hay Day Derby then your must follow the stated Hay Day Strategy and Hay Day Derby Tips. Most importantly Hay Day Derby Tips is to keep in touch with your neighbourhood members and tell them if you don’t want to participate in next derby use opt in/out function to opt out from the next derby so that the score doesn’t get below average. 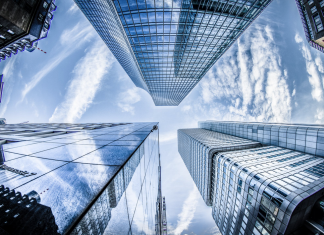 Ask your members to do 300+ tasks above and delete all 300 below tasks from the board. Secondly, the important Hay Day Derby Tips which I consider is making your all members to elders so that they are able to delete below 300 tasks. Encourage your members to help each other and try to do all 320 tasks which is of highest value in the current derbies. First thing is to remember is play as a team and follow the strategies. To do Hay Day Derby Help Task in quick span of time your other neighbourhood member must have saved the required bushes for you. You can easily save bushes for help task by not putting on help in else time when no one need help. To do Hay Day Derby Train Task in quick span of time you must have upgraded your train to carry all 10 passengers. Get 10 passengers from your neighbourhood member and serve them which asks you to serve only once. Remaining who asks for two or three services send the away. When you are finished serving the town visitor once don’t collect the money, prizes and xp’s, instead leave them and serve more visitors up to your town capacity. When you have taken train task collect prizes one by one and once you are completed with task stop collecting from further visitors. For fishing task the Hay Day Derby Tips is simple. Don’t collect the fish until the catching spot is very small. because the small the catching spot the more high lbs of the fish you will collect. It helps you complete the Fishing task in less time. There is no such Tips and Tricks for Boat Task. Only you can use diamonds to speed up boat arriving time. Similar is what with feed and harvesting tasks. There is another Hay Day Derby Tips for other tasks as well like Pumpkin Pie making task, woolly hat task, blackberry muffin task and other similar food production tasks. For these tasks, you must start producing products before the day of derby and be in cooperation with hood members and let them know which tasks are you preparing for and your other hood members should also know about it. This is not the really Hay Day Cheat but you may consider it as a Hay Day Cheat. So, with this Hay Day cheat you will learn how to win the derby. This Hay Day Derby Cheat comprised of Timing and cooperation of hood members. First lets talk about that what is meant by timing in Hay Day Derby Cheats. For a guaranteed win in Hay Day Derby either you are in Rookie league, Professional League, Novice league or Expert League you must start derby from the time when it says only 5 days left. By starting late, you get an easy competition with inactive hoods. 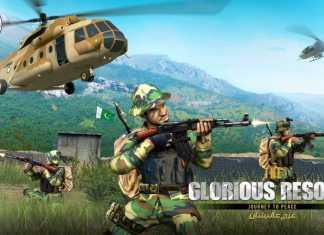 In this meanwhile no member should take the task, however, you can delete useless task. This trick doesn’t works for Champions League because all hoods in Champions league are already active. To win the derby in Champions League you and your hood member needs to be super active. Hay Day Derby cheats to win in Champions League is simple you and your hood members have to do all 320 tasks with an additional task. 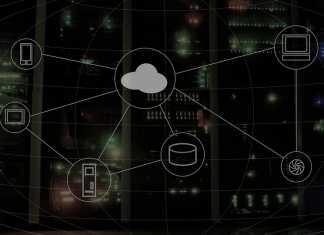 But to be quick with your 320 tasks is be prepared for the all the common derby tasks. Like this you need to take that task and complete it in seconds. Some of the quickest 320 derby tasks include help task and catching ores task. 320 Serving Town Visitor task can also be quick if you have served all 23 visitors in town, for this you have to serve all of them before derby or during other tasks and do not collect prizes for them. Send back the visitors that needs to be served 2-3 times. Now get 10 town visitors from your neighbour hood members town which is required to be served once. This way you need to call the train three times a day to serve 30 town visitors. 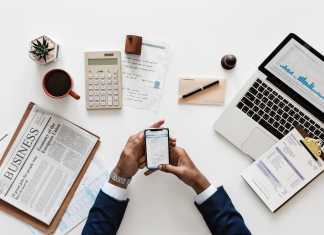 Similarly, for 320 tasks for products, start producing products that are common with 320 tasks like pumpkin pie tasks, blackberry muffin task, woolly hat tasks, chili popcorn task and etc. but do not collect them. 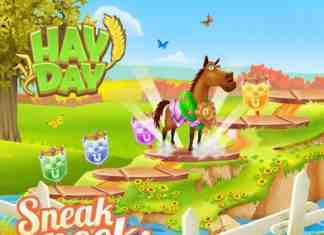 By these Hay Day Derby Cheats you can quickly complete your derby but you will be short of other Hay Day products. 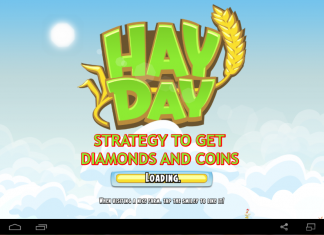 Hope you like my new article on Hay Day Derby Tips. 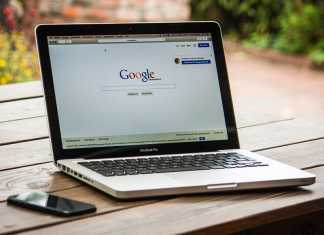 More good and exciting articles and coming soon so stay connected with us. Dont forget to share :). It means equal number of active derby players. If your hood is playing derby with 4 active members then the other hoods in the competition would have same number of participants in derby. My neighbor has 2 more task left to complete derby task board don’t let her to play anymore why? May be she is on low level and cannot do task of above level. Could you translate this into English please? Hi, my Group is in champion league now. I’am very surprised in this league,all is very active, even They could finish 10 tasks with 320 point, only in 5 hours. I don’t know, which tricks they used. Becoz, I tried to very active too but I couldn’t get good tasks (I mean task with 320 point, which we can finish fast like mining task, truck task, town task. I did to prepare it before derby starts,). I spent the time only to trash tasks, even more than 100 tasks meanwhile they finished all task T_T. Hi Avicenna, Obviously they are using diamonds to complete their tasks. I would suggest you to start derby from Thursday if you have 10 members if you have 5-6 members then start from Friday. Meanwhile keep on trashing tasks until and unless your desired task appears. But take task on Thursday or Friday it will make competition easy. How to get every derby task above 300 points? 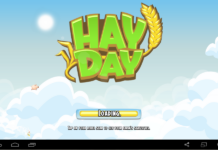 It totally depends upon Hay Day servers. There is no trick for it. We are new. The result of a neighborhood split we brought the best to our side!! The intention is to grow the hood to 30 though that may take a while to get the exact perfect mix of 30 people. The reason I want it to be 30 is because that way if we have an off week or we make a mistake or we don’t feel like playing derby it is not so imperative because we have others to rely on. I am willing to wait months to get to the perfect mix of 30.